Growing up in a military family, Taylor Owens has moved all over the country. When she was only eight years old, she visited Prairie Meadows in Iowa to see her uncle's horse run. From that visit, she knew she wanted a career as a racehorse trainer. 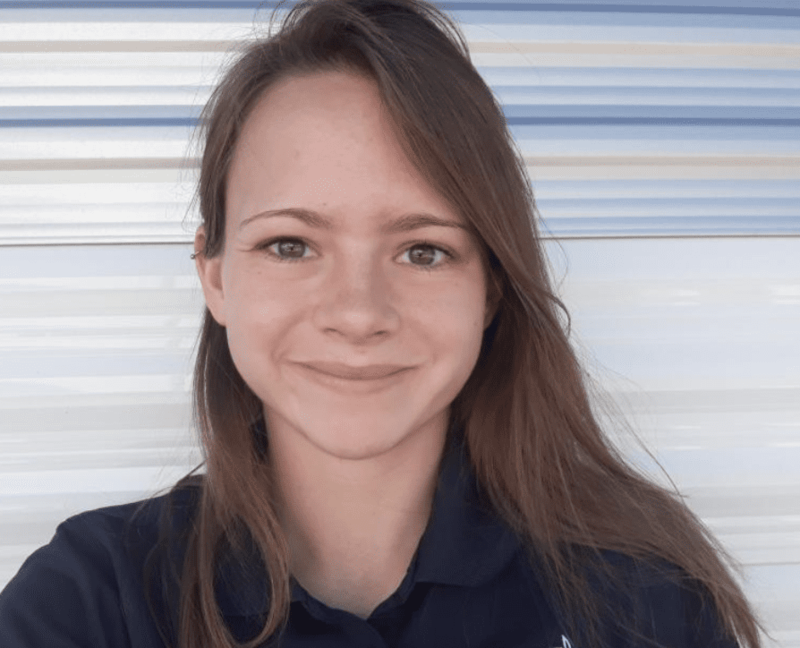 When she was old enough, Owens spent summers learning from her uncle's trainer, and ultimately made the decision that attending the Race Track Industry Program would put her on the fast track to becoming a trainer herself. What kind of work have you done at Rillito Race Track? In my first season working at Rillito Race Track, a lot of care was given to ensure I was placed where I wanted to be. In the mornings I helped create tip sheets, which contained my picks for the day's races and co-hosted the morning show. The morning show is a half-hour show before the first race where I had the platform to share my picks for the days races and why I chose them. In the afternoons, I worked with the social media team getting photos, fan interviews and ran the Rillito Park Twitter page. Did you have a favorite horse or horse racing moment growing up that has stuck with you? My family and I were in the middle of a move in the summer of 2015 as American Pharoah made his bid for the Triple Crown. On June 6, 2015, my family was in Yellowstone National Park, minutes from the eruption of Old Faithful. Over the car stereo, it was post time for the Belmont. The decision was easy for me, and as the rest of my family hurried to watch the geyser, I sat in the car with my dad and we listened to the race. Together we cheered American Pharoah on, and admittedly I cried when I listened to him cross the finish line. It's probable that was my only opportunity to see the geyser erupt, but I'll never forget the elated feeling American Pharoah gave me when he swept the Triple Crown. What do you consider the most important problem facing the racing industry? How would you go about solving it? In my experience, the horse racing industry has a rather negative reputation to the everyday citizen. I would consider, then, that this negative public perception is the biggest problem. There are many things that contribute to this, so there's no real one way to solve it. A few things can be done that most people could get on board with, including more public outreach. Educating the public is important. The horses are treated very well on the back side, and being that the public cares how they are treated, tracks should do more to be transparent regarding the safekeeping of the animals. When the public is shown that the equine and human athletes are put first, and the measures in place to protect them, it will go a long way to creating racing fans and even advocates. What do you hope to do in the industry after graduation? All I've ever dreamt of doing, since I was eight years old, was to become a racehorse trainer. Attending the Race Track Industry Program has shown me other potential career avenues available, but that early dream of mine has not wavered. After graduation, while I don't have any set plans, I would like to spend some time under a few different trainers, learn different approaches and ways of doing things, and ultimately set out on my own. No female trainer has ever trained a Kentucky Derby winner, and this is a driving force behind what I do. Whether or not my hard work pays off, I'll be living my dream. What's an example of something you think is being done right within the industry? Why? Thoroughbred aftercare is getting more press and attention than it has in the past, and attention to these programs and adoptions of off-track thoroughbreds is up. With as much concern as there is about the horses and what comes of them after the track, I think the fact that aftercare programs have been given spotlight is fantastic. I also applaud tracks and prominent figures in the industry that provide these programs some publicity. The idea that racehorses can be retrained and rehomed, and that the industry is working to make that happen, will not only help thousands of animals but as a whole will help racing's image. I think that right now, aftercare programs and the promotion of those programs, is something the industry and horse people are doing right. This entry was posted in NL List, People, Racetrack Industry Student Experience and tagged horse racing education, PariBet Racetrack Industry Student Experience, Rillito Park, Taylor Owens, University of Arizona Race Track Industry Program by Zachary Taylor. Bookmark the permalink.